Tired of permanent sticky labels gumming up your office furniture and walls? Does writing on the office communication board make your hand cramp? 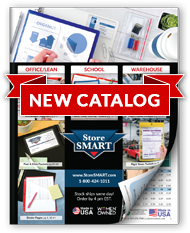 Take control of any flat, clean surface—with StoreSMART's Window Frame Style Adhesive Document Holders! This convenient 11 x 17 ½" size is perfect for incorporating 11" x 17" (A3) printouts into your 5S or visual management displays. Each holder is open on the long side to make swapping paper labels a breeze, and designed to frame your content with an attractive ½" border. The reusable adhesive strips allow you to stick these holders almost anywhere. Color-code your information to bolster employee comprehension, or utilize a variety of shades to bring a touch of color to your next meeting. Three ¾" x 10" strips of reusable adhesive on the back. They work just like sticky notes—stick them up, peel them off, and stick them somewhere else! Overall size: 12 3⁄8" x 18 7⁄8". Inside capacity: 11" x 17 ½".